DETROIT -- Bentley has announced the name of its first-ever SUV, to be revealed later this year. It will be called the Bentley Bentayga. Bentley CEO Wolfgang Durheimer said the name has three sources of inspiration: the Taiga, “the world’s largest transcontinental snow forest;” Roque Bentayga, a mountain peak in the subtropical Canary Islands; and the name of the founder of Bentley Motors: W.O. Bentley. “Bentayga is a name that reflects what we know our SUV will do better than any other car in the world -- combine the best automotive luxury with outstanding performance to take the Bentley experience to new environments,” Durhemier said in a statement on Monday. The Bentayga will be introduced later this year and will go on sale in 2016. Durheimer said Bentley has already taken deposits from 4,000 customers. Durheimer said Bentley hopes to gain new customers from two sources: existing Bentley customers, who have an average of eight vehicles in their garages -- including one or two SUVs -- and owners of other vehicles who might consider buying a Bentley. 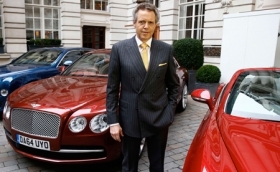 Bentley is working with its dealers to prepare them for taking non-Bentley brands in trade. The Bentayga will be built on a dedicated SUV platform and a separate line at the company’s factory in Crewe, England, where the company is adding 900 new jobs. Bentley still has 300 open jobs across all aspects of the business including engineering, manufacturing, sales and marketing, he said. Durhemier said the Bentayga could help Bentley get a bigger foothold in several global markets where it does not have a big presence including South America and several Asian countries. Duerheimer told journalists last week that the SUV’s level of luxury would be "extraordinary." He said some versions would cost more than the company’s most expensive car, the Mulsanne sedan, which sells for 229,000 pounds (294,000 euros). The Bentayga will be powered by Bentley’s 12-cylinder gasoline engine, with a plug-in hybrid and a V-8 diesel coming later. Bentley expects the vehicle to help almost double its annual vehicle sales to 20,000 by 2020. The brand's global sales increased by 9 percent last year to a record 11,020.